It’s been quite a while since I’ve done one of these Sanity Savers posts, but I just had to share one of my favorite new sanity savers! I was recently introduced to the Hotslings line of baby slings, and oh my, how did I make it through the four previous kids without discovering these? Yes, I’ve used slings with the others, but none of them had the leg padding feature like these that makes the hip carry so much more comfy for baby. No more fabric digging into those adorable, dimpled baby thighs! Hotslings allow me to tote my clingy baby boy around the house with me, while keeping my hands free to do other things. They come in an array of colors and fabrics (including reversible! ), with price points ranging from the low end of $48 to $60 up to $105 to $150 for the high-end luxury fabrics in The Haute Collection. Safe for newborsn & toddlers up to 35 lbs. Leg padding built in for comfort & support. Multiple carrying positions: cradle, hip & front. Sling and Go. It is that easy. Hotslings also has a gorgeous new line of nursing covers that make nursing in public discreet and chic! Through December 31st, Hotslings is running a promotion where you’ll receive a complimentary pair of BabyLegs with any Hotslings purchase! If you’ve never heard of BabyLegs, they’re a line of leg and arm warmers for babies and young children that are to die for cute. Hotslings would make a fabulous Christmas gift for expecting moms, new moms, or even moms with toddlers – practical and useful but fun and stylish all at the same time! Have You Heard About Smartbargains.com? Since becoming a mom, new clothing, shoes, accessories and all that fun stuff have pretty much been relegated far down the priority list. And since I’ve been consistently pregnant or breastfeeding for going on seven years, what I did purchase mostly doesn’t fit anymore. Baby number five is our last, so I’ve slowly been buying myself a few things here and there, and I’m thoroughly enjoying every minute of it! I was on a mission to find myself a cute new pair of shoes today when I stumbled upon Smartbargains.com. I’d heard of them in passing before, but I’d never purchased from them. I was pleasantly surprised to find that they have a large selection in all categories and that the prices were very affordable. Since I was looking specifically for shoes, I really liked the fact that I could choose what style of shoe I was searching for (women’s casual shoes) and the size (9 – btw, did anyone else’s feet get BIGGER and stay that way after having a baby? SO frustrating). Smartbargains created a list for me with all shoes in that category in my size which led me to these adorable Steve Madden Slip-ons that were marked down to just $39.99 (regular $199.99)! Now, I’ve mentioned before that sometimes quality trumps price, and shoes definitely fall into this category for me. I bought two pairs of really cute flats at Target recently that added up to the same price as these; however, I wore one pair on Sunday and after walking around for less than 30 minutes, I had blisters like you would not believe. Since both pairs were by the same manufacturer, I’m worried the other pair will hurt my feet as well, so they’re both going back to the store. My experience overall was very positive. Navigating the site was simple, and checkout was a breeze. Now I just have to sit back and wait for them to show up! I have my eye on several other cute items on the site, but I have to tell myself one thing at a time. So tell me, have you used Smartbargains.com before? What was your experience like? I’m thinking this could be a great resource for holiday shopping. My kids are messy . . . really messy. The amount of crumbs that amass under my kitchen table through three meals a day, plus throw in a snack or two, well, it’s just astounding. And I must confess, I really hate sweeping. It’s just darn near impossible to make a nice neat pile of dust, dirt, and whatever morsels the kids have dropped with the five of them and two Italian Greyhounds running around. 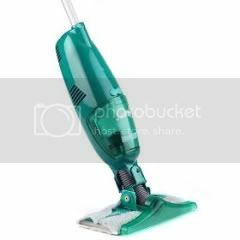 That’s where my Swiffer Sweeper+Vac comes to the rescue. I really, really, really, REALLY love this thing. It makes cleaning up their messes a breeze – well, as long as I remember to plug it back in to recharge it after using it that is. I don’t mind giving the kitchen floor a quick once over with this several times a day. It’s quick, easy, and there’s no messy dustpans to deal with. You just open the little compartment that collects the dirt, dump it, and put it back. Every few days I change the cloth, and I’m good to go! BTW, I’ve got some great frugal tips for saving money on those cloths, but we’ll get to those another day. You can pick one of these up at your local Walmart, Target, or KMart, just to name a few, and right now, you can get a $5 coupon by signing up to receive Swiffer promotions. Come on – join me in my infatuation! 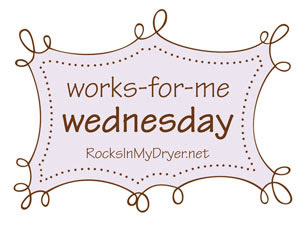 For more Works for Me Wednesday tips, visit Rocks in My Dryer! I won’t kid you. Being a mom to five children under the age of six is by no stretch of the imagination easy. Rewarding, yes. Easy, a resounding NO! And by far one of the most trying times is dinnertime. Everyone is usually cranky and irritable, and of course, they’re all hungry and want their food immediately. This is where one of my little secret sanity savers comes in. Oh, I have lots of these little tricks up my sleeve, and I’ll share them all with you in due time, but this is one of my favorites. Some are frugal, and then some are not so frugal, but sometimes Mommy’s sanity is worth more than saving a dime. However, I always do my research to get the best price! On to my secret . 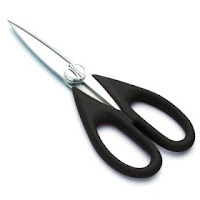 . .
Yep, that’s right – my trusty KitchenAid All-Purpose Kitchen Shears. Of course mine are red to match all my other KitchenAid utensils and appliances! Yes, not so frugal but very durable . . . I use these babies for every task imaginable. They’re great for chopping up still-frozen chicken for stir-fry meals or other recipes that call for diced chicken or any other kind of meat for that matter. I use them to mince herbs, chop celery, cut up grapes – you name it. And the great thing is you can cut stuff right into the pan you’re using. But the very best use I’ve come up with is quickly cutting foods up into bite-size pieces for the kiddies. It makes quick work of any meal, including pizza, hot dogs, hamburgers, chicken, etc. It lets me assemble their plates quickly and easily, getting them all served and ready to eat without the dangers of slicing or dicing my finger with a knife. (Who, me? I’ve never done anything like that.) My neighbor was an instant convert when she saw me quickly dice up a slice of pizza for my 2 year old at her birthday party. I have at least four pairs of the shears so I always have a clean pair. I also have numerous pairs of their other styles, including the herb shears, poultry shears, bent shears, and utility shears, but the all-purpose kitchen shears will always hold a special place in my heart.